Peter Fish yo-yos have been sighted in the wild! 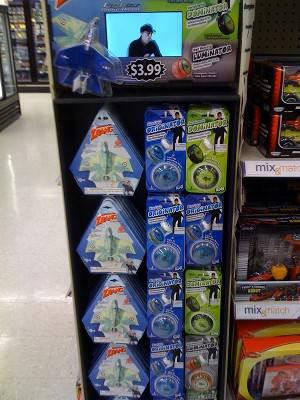 This picture was taken at a Walgreens in Portland, OR today showing a display with Originators, Dominators, and Luminators alongside the Zrang airplanes. On the video monitor you can see a short commercial for the yo-yos that shows me doing a few one and two-handed tricks. Checkout the Walgreens in your area and leave us a comment if you find any of our yo-yos.